“I like cake. A lot. Probably more than I should. I am an equal opportunity cake lover; cupcakes, sheet cakes, layer cakes. If you have ‘cake’ in your name, we’re going to get along. 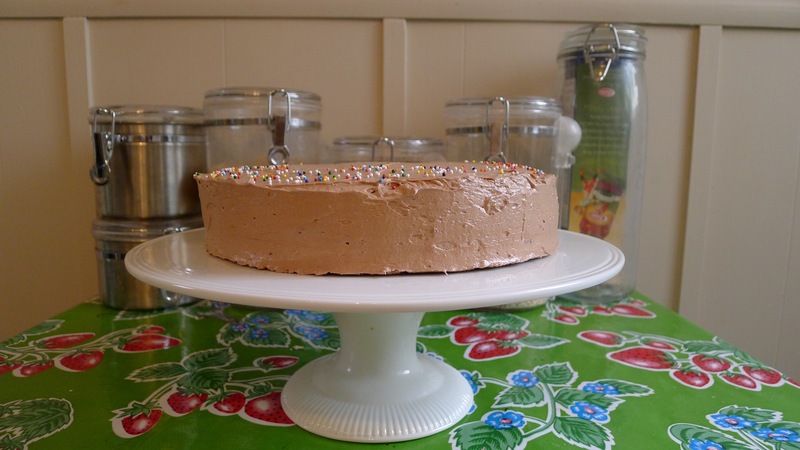 So, pushing aside any pie vs. cake awkwardness, I, the Patron Saint of CAKE, would like to share with you a little story about a girl, a birthday, and an epic baking adventure. Besides my aforementioned obsession with all things cake, I also have a passionate love of Birthdays, which works well together. In the past, I’ve enjoyed some very lovely and delicious cakes from some of my favorite bakeries in San Francisco on the happiest day of my year. 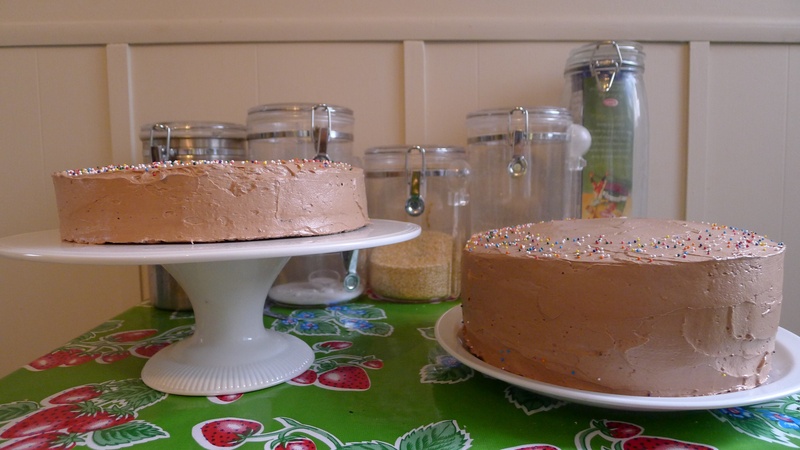 This year, however, as I was in super-saver mode in preparation for a summer farming expedition, I decided I would bake my own birthday cake. Luckily for me, the recipe selection was a piece of…sweet baked batter. Recently my amazingly talented cousin had begun sharing her recipes and photos on her baking blog, and the idea was conveniently presented to me via Google Reader. The six layer, chocolate cake with two kinds of frosting (toasted marshmallow and chocolate malt) was calling to me from the interwebs, and I had to have it. After making a list (I also love lists), collecting the ingredients, and setting a baking date, I was ready. I decided to split the six layers into a two and a four-layer cake, as I would be transporting the dessert to the celebratory dinner, and I didn’t trust myself to not destroy it en route. The baking, whipping, toasting and tasting all went exactly to plan and voila! CAKE! The finished product was everything I had hoped for. It was also really intense, especially after gorging on Ethiopian food. Bloated bellies aside, the cake was not too sweet, which was a good pairing for the super sweet frostings (though the toastiness and malt kept them in check). My brain can’t comprehend when I hear a complaint of something being “too sweet,” but I may have got a glimpse of that reality with this baby. All in all the cake and the birthday made my dreams come true, and I had cake for breakfast for two days after (ok four). Breakfast of champions! Preheat the oven to 350 degrees F. Melt butter then set aside. Whisk together the sugar, cocoa powder, flours, baking soda, and baking powder. In the bowl of an electric mixer fitted with the paddle attachment beat the eggs for one minute then mix in the sour cream and buttermilk. Add the flour mixture and beat until smooth. Pour in the melted butter and mix to combined. Spray three 8 inch cake pans with baking spray and divide the batter evenly among them. Bake for 40 minutes or until cake tester comes out clean. Line a baking sheet with parchment paper and set oven to broil. Broil marshmallows for about 2 minutes or until toasted. Keep a close eye on them so they don’t burn. In the bowl of an electric mixer fitted with the paddle attachment beat together the butter and powdered sugar until combined. Add the vanilla and beat for a few minutes until fluffy. Beat in the toasted marshmallows and the marshmallow fluff for a minute or so. Melt chocolate and set aside. In the bowl of an electric mixer fitted with the paddle attachment beat together the butter and the powdered sugar until combined. Beat in the vanilla and malt powder. Pour in the melted chocolate and beat for two minutes. Add the whipping cream and beat for another minute or until fluffy. Slice each layer in half and trim the tops if necessary. 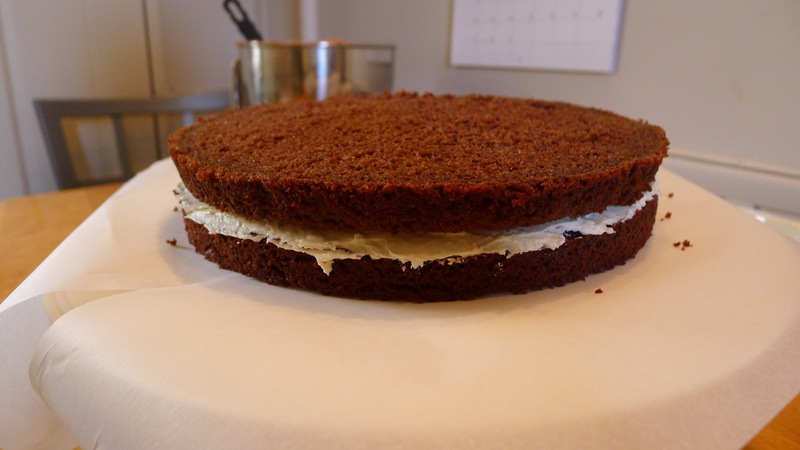 Place bottom layer on cake board and frost top with the toasted marshmallow buttercream. 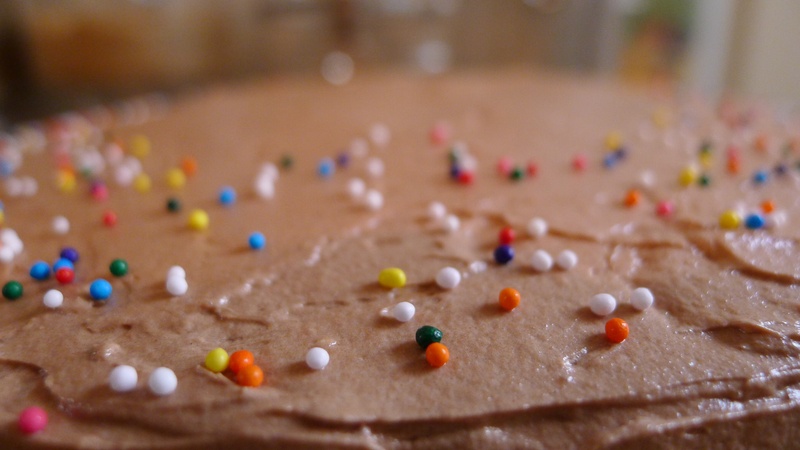 Add the next layer and frost with the chocolate malt buttercream. Continue to layer and frost alternating between the toasted marshmallow buttercream and the chocolate malt buttercream. 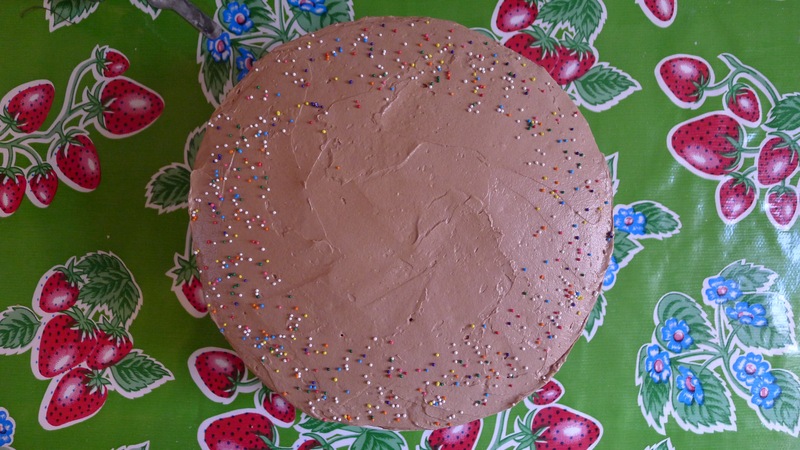 Frost the top and sides of the cake with the rest of the chocolate malt buttercream then top with sprinkles if you like. This entry was posted in Not pie and tagged birthday, cake, chocolate, guest post, malt, marshmallow. Bookmark the permalink.